Diabetes is a group of diseases that disturb the production of blood sugar in the human body. Blood sugar is also called glucose. It is important because our body’s muscles and tissues are made up of cells. And glucose is an important source of energy for the cells. It’s also vital for our brain’s main source of energy. There are two types of chronic diabetes disorders like type 1 and type 2 diabetes. Possibly adjustable diabetes conditions are called as prediabetes, while the blood sugar level is higher than in normal condition. The primary reason for diabetes depends on its type. It doesn’t matter what type of diabetes you have. It can occur due to the excessive blood sugar level in the human body. Higher blood sugar level can occur to serious health difficulties. Read More: Top 9 Early Signs and Symptoms of Diabetes for All: MUST READ! Currently, diabetes disorders are dramatically increasing- according to the experts. 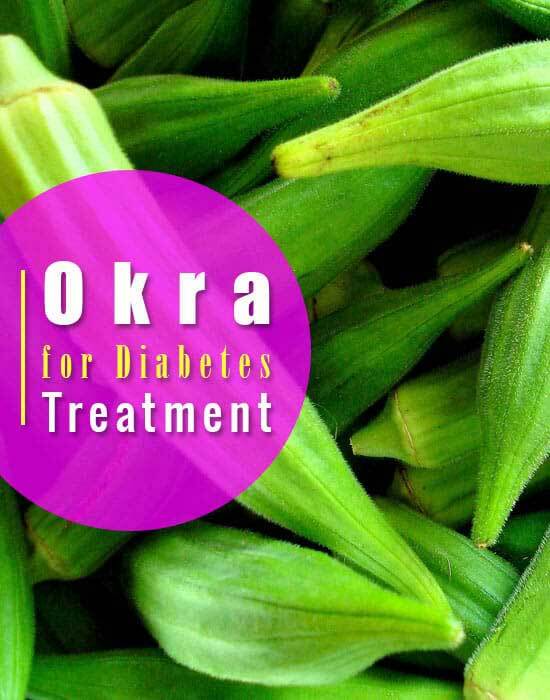 The experiments are being proved that okra can be applied successfully as direct treatment of diabetes. Let’s see the health benefits of okra for diabetes treatment. A green flowering plant okra is also known as lady’s finger. Okra is regarded as a favorite food for the health-conscious people from the beginning. It contains potassium, vitamin B, C, calcium and folic acid. For the presence of low caloric and higher dietary fiber content, currently, the benefits of okra for diabetes is being verified. Okra has been advised to control blood sugar in type 1, type 2, and gestational diabetes. Okra has higher fiber content. About 8 medium sizes of okra pods contain 3 grams of fiber. It helps digestion, decrease cravings, which keeps you to be fuller for a long time. Because higher fiber foods are important for diabetes treatment. Eating high fiber foods have been proven to promote better insulin control. Studies on mice proved that okra seed extracts have an anti-stress effect in the blood circulation. Stress levels controlling is a vital part of diabetes treatment. Because the higher level of stress can cause higher blood sugar level. Mental health is regarded as an important part of any diabetes treatment. Therefore, adding okra can be a part of your diabetes treatment plan. Studies on mice in the laboratory proved that okra helps to lower cholesterol levels in diabetes. Foods those contain antioxidant and high fiber content are suggested for the people with diabetes. Because okra has the ability to lower cholesterol. According to The American Heart Association– unhealthy and higher cholesterol levels are not good for diabetes. For this reason, confirm your diet has healthy cholesterol levels. One study shows that okra plant can be improved your fatigue levels. If you add this diet to your exercise routine, you will be able to do exercises for a long time. Cardiovascular movement is a vital part of treating diabetes. The okra plant may give a more active lifestyle. Okra peel is one of the old-style medicinal methods to use. The primary research already has done to find out the benefits of okra, but shredded okra peel exposed to be the most favorable way to take it. You can make your own okra peel using a kitchen grater. The powdered form of okra seeds is also helpful for people with diabetes. At first dry okra seeds and ground well. It takes a bit time and effort. On the other hand, you can buy powdered okra seeds from the supermarket. Read More: 14 Best Ways to Prevent Diabetes at Home: Nobody Should Skip! Drinking okra water helps to lower diabetes. Make your own okra water for diabetes at home by soaking okra pods into water overnight. The wrathful nutrients from the pods and skin will be extracted into the water. Don’t look into the taste (a little bitter) of drinking okra water directly. It is a simple method to get okra benefits for diabetes. Wash the okra pods properly. Clip and split both ends of the pods, divide them using a knife. Place in a jar and cover them with water. Soak for as a minimum eight hours or overnight. Then squeeze the pods into the water. Drink the water for at least one time daily in the morning.